Elevator lace-up derby shoe with upper in full grain leather, vegetable tanned, perforated by hand. A wardrobe must-have to make a statement with every look. 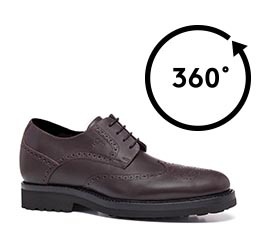 The harmonious lines of the dark brown upper, the rounded toe end and the outsole made of 100% natural rubber, make this shoe the best option to complete both a casual or a formal outfit. The inner height increaser can be choosen between 2.4, 2.7 and 3.1 inches.